Without a doubt there are a lot of popular books about heaven. But there are quite a few readable and interesting scholarly ones too. • Jeffrey Burton Russell’s A History of Heaven: The Singing Silence discusses heaven in church doctrine, literature, and art from the early church to the fourteenth century, and his Paradise Mislaid: How We Lost Heaven—And How We Can Regain It considers how views of heaven have evolved in the last 100 years. 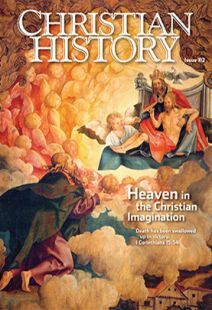 Colleen McDannell and Bernhard Lang take a similar survey approach in their Heaven: A History, as does Alister McGrath in A Brief History of Heaven. A somewhat older book on the topic, but still worth reading, is Ulrich Simon’s Heaven in the Christian Tradition. John Casey’s After Lives: A Guide to Heaven, Hell, and Purgatory serves as a “reader’s guide to views of the afterlife across centuries, cultures and religions.” J. Edward Wright’s The Early History of Heaven discusses the cultural context of early Jewish and Christian ideas about heaven. And, given the modern popularity of stories of near-death experiences, Carol Zaleski’s Otherworld Journeys: Accounts of Near-Death Experience in Medieval and Modern Times is well worth checking out. • Heaven (and hell) as pictured in Christian art appear in many books, among them Robert Hughes’s Heaven and Hell in Western Art; Rosa Giorgi’s Angels and Demons in Art; Erika Langmuir’s Heaven in Art; and Nancy Grubb’s Revelations: Art of the Apocalypse. • If heaven in poetry is your thing, excellent translations of the Divine Comedy are available: try the Penguin Classics translation by Dorothy L. Sayers and Barbara Reynolds, the Everyman’s Library edition by Allen Mandelbaum, or the version by John Ciardi. “Pearl” appears in The Complete Works of the Pearl Poet (translated by Casey Finch), The Dover Thrift edition of Paradise Lost edited by John Himes is a good place to begin reading Milton’s take on heaven and hell. • The History of Hell, our 32-page resource guide describing three historic views of hell. Videos from Vision Video . . .
. . . include two adaptations of Bunyan’s classic (Pilgrim’s Progress: Journey to Heaven and Dangerous Journey), the Book by Book DVD session on Revelation, The Incomparable Christ (episode 4 of The Eternal Jesus), Heaven is for Real, and Heaven: One Minute After You Die. • At Hymnary.org, the great hymn research site containing over 5,000 texts and tunes from many Christian hymnals, you can access 1,200 hymns on heaven (as well as all sorts of other information, including the biographies of over 1,000 authors who wrote hymns on heaven). Go to www.hymnary.org/texts?qu=topics:heaven. • A similar search at the Christian Classics Ethereal Library, www.ccel.org/search/fulltext/heaven, will lead you to countless primary sources discussing heaven—even more hymns, texts from the church fathers, biblical commentaries, devotional literature, and references to heaven in everything from Augustine’s Confessions to Calvin’s Institutes.